Marketing Master Profile for Neil Patel. What’s This? Neil Patel has been one of my favorite online marketing mentors for a long time. I read his blog posts religiously from both Neilpatel.com and Quicksprout.com. It’s entirely fitting that his is the first Marketing Master Profile I publish and that his is also #1 and #2 among the Top 15 Marketing Masters websites I track. If we look over the data, Neil excels by exceeding the averages among his rarefied company many times. Just look at all the green highlights on the various panels. It’s tough enough to break into the Top 15, but to beat most of them in detailed areas is even harder. He’s exceptionally good at driving Referral traffic. No doubt this is due to his extremely comprehensive “Skyscraper” style posts and his extensive efforts to build his personal brand. What that means is you know at a glance when you see a link to his site that it’s likely worth clicking. 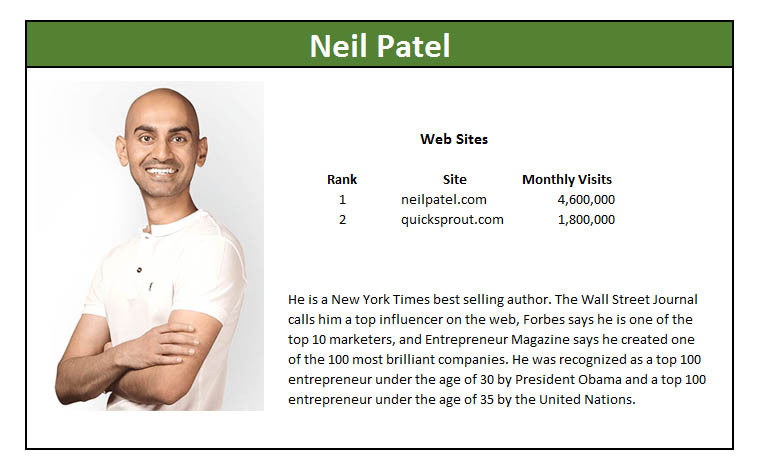 We can confirm the high quality content as both Neilpatel.com and Quicksprout.com beat the Top 15 average on two key content quality measures–Average Duration on an article, Ave Pages read per visit. Neilpatel.com is getting tremendous value from both Email (nearly 2x the average traffic source) and Social Media (50% more than the average). We break SEO Efficiency into two categories–Backlinks and Keywords. Starting with Backlinks, Patel’s sites both score higher than the Top 15 average on Domain Authority. This is a combined measure of number of backlinks together with the quality of the backlinks. Neilpatel.com has a huge number of backlinks, and while many of them are not very high quality, in aggregate they do the job. Quicksprout.com gets higher quality backlinks and has a higher Domain Authority. Interestingly, both sites get more visits per Domain Authority point than the Top 15, but Neilpatel.com gets almost double the number versus Quicksprout.com. We can only surmise some of the links are driving an awful lot of traffic. In fact, when we turn to Keyword efficiency, NeilPatel.com does quite a bit better than Quicksprout.com though the latter still beats the Top 15 average. Great keyword research coupled with the ability to rank for the best keywords are the hallmarks of driving big SEO traffic, and Patel has it down. Turning to Social Media, Patel does significantly better than the average for Facebook, Twitter, and “Other” in both properties. In addition, Neilpatel.com excels at LinkedIn while Quicksprout.com is better at YouTube. Congratulations Neil Patel, great profile!